It’s really interesting what kids form sentimental attachments to. My parents moved from suburban New York City to Princeton, New Jersey when I was in college. Olof’s parents, meanwhile, had their East Bay home eminent domained to make room for an interchange between the 680 and 24 freeways. In both cases, our mothers asked their young-adult children what items they particularly wanted saved in the moves. Both mothers claimed to be astonished by the kids’ choices. Where had they gone wrong? In Olof’s case, he and his two sisters engaged in ardent verbal combat over who was going to get custody of the pollywog pan. It was actually an old canning pan from their grandmother’s home in Salem, Oregon, that had been used for canning applesauce. But Olof and sisters used it in the creek behind their house to capture pollywogs, who perished by the thousands, the few survivors becoming toads in the family’s garden. 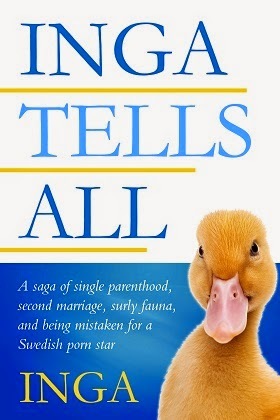 Olof had better hope that on Judgment Day, pollywogs don’t get a say as to what happens to you. In my house there were several hotly contested items. One was the Kool-Aid pitcher, a hand-painted ceramic vessel of dubious origins that probably leached lead. In the summer months, that pitcher was refilled continuously with artificially-colored powdered dye and diabetes-producing quantities of sugar. When I look back on how much of that stuff we consumed, I can’t imagine why our own kids weren’t born with two heads. But my sibs and I were deeply, emotionally attached to that pitcher. I think it symbolized a carefree time in our lives when summers were unscheduled and the neighborhood kids just went out and played all day, wandering en masse from one house to another to empty that home’s Kool-Aid pitcher before heading back out again. 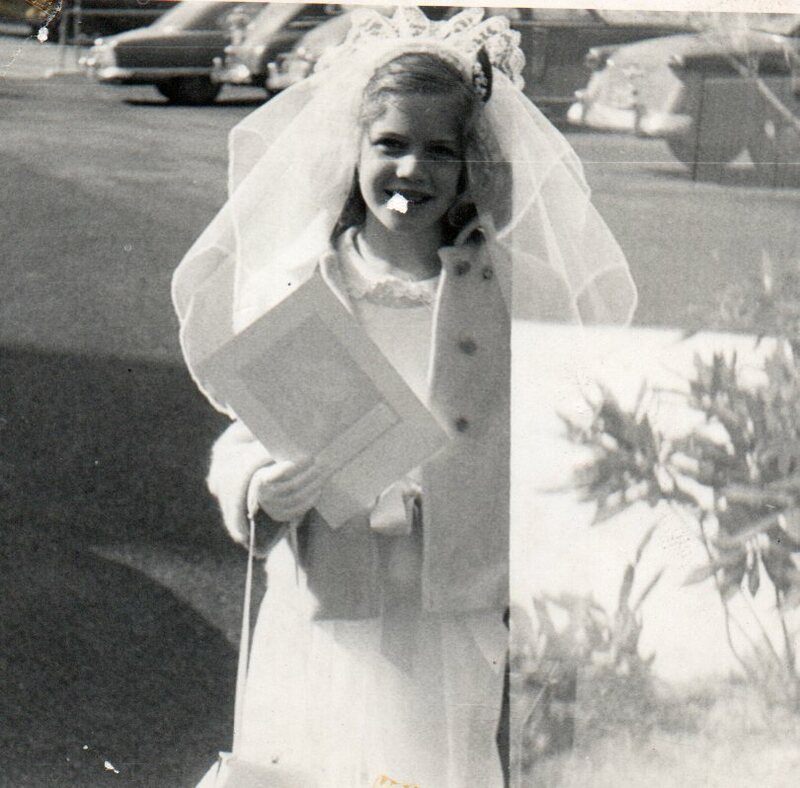 My sister and I also fought vigorously over the First Holy Communion veil that our Catholic (as opposed to our Protestant) grandparents had given us. At the time, there was a standard issue veil that girls received as part of their First Holy Communion package but my grandparents, deciding that we were already at enough of a disadvantage having a Protestant mother, bought us a veil that both my sister and I thought was the most beautiful creation ever made. It had seed pearls on the top and lots of tulle. I wore it first, then my sister wore it for her First Holy Communion the next year. The third item I coveted was a cheap plastic reindeer ornament that had come from the set of the GE-sponsored Fred Waring Show, one of the first musical-variety shows on TV. My father’s first job out of business school after the war was in television advertising. Dad would regale us in later years with stories of live ads – all ads were live then - that went totally wrong: opening the freezer of the Mr. Frosty refrigerator to demonstrate how cold it kept the ice cubes only to find that the hot studio lights had melted them. Or the time that someone stole the GE iron right before show time and the single store open on a Sunday afternoon only had a Westinghouse model which, in desperation, they used. When the show disbanded, ornaments from the show’s Christmas tree were distributed to employees. I always made sure the reindeer was hanging near my presents. So, here’s how it all came out. Olof and I are, in fact, in possession of the pollywog pan. We recently updated our wills and trusts and I told Olof that it would be a nice thing that if in the list of bequests, he leaves the pollywog pan to his sisters. Maybe they can start fighting about it all over again. As for the Kool-Aid pitcher, my mother maintained she didn’t know its whereabouts but I think the real answer is that it had been relegated to the Salvation Army bin years earlier and was now shortening the lifespans and damaging the brains of a whole new generation of children. As for that cheap plastic reindeer, it’s still got a special place on my Christmas tree. I guess one out of three ain’t bad. And sorry, sibs: I am NOT sharing.